REC'D A PEARL WITH DIAMOND WHITE GOLD RING TODAY AND PURCHASED IT AS 18K GOLD. 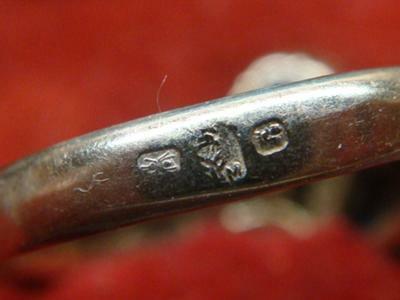 IT HAS THE MOST UNUSUAL HALLMARKS ON THE OUTSIDE OF THE BAND. WELL AT LEAST TO ME IT DOES. I HAVE ATTACHED A PHOTO OF THE MARKS. ANY INFORMATION WOULD BE HELPFUL!! THANK YOU SO MUCH!